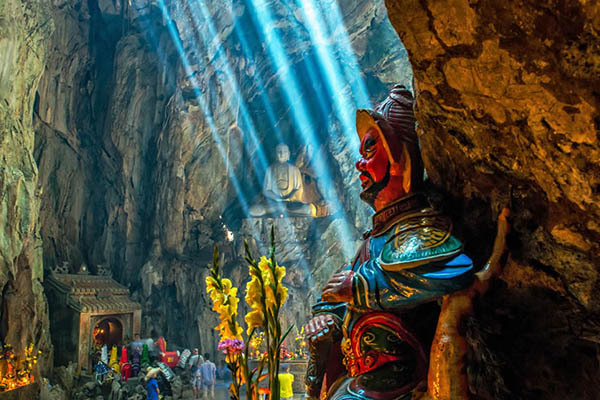 Vietnam Multi Center tour allows you to combine all of what you want to see a destination, all into one trip. The journey combines with stunning natural scenery, historical sites, and savor lifestyle in three cities- anything is possible! From the accumulated experience years, this 4-day private Multi center tour offers you the opportunity to taste a lot of traditional foods, learn some basic working skills, especially, feel the enjoyment of fruits. Our experienced consultants are on hand to help you select the best destinations, put together the most suitable itinerary. On the road, you will be transferred to Ngu Hanh Son (Marble Mountain) which is the attractive destination in best tours in Vietnam. It is a combination of five marble and limestone mountains. Their names are metal, wood, water, fire and earth. These mountains have an impressive system of caves and tunnels. In history, they were used as hiding places and important basis for the Vietnam revolutionaries. After that, you catch up Hoi An town. Historic Hoian is Vietnam’s most atmospheric and delightful town. From the 15th to the 19th century, Hoian town becomes an exceptionally well-preserved example of a South-East Asian trading port. Its homes reflect the influences in the foreign, that have combined to produce this unique heritage site. Otherwise, if you want to have more experience in the trip, you should rent a bicycle is an excellent way to get around as it’s cheap and easy to park. Coming here, you should taste many traditional foods such as chicken rice, Cao Lau, bread, pancake, tea and so on. Continue the Vietnam Multi Center Tour, you go to Cua Dai beach for some sun and sand. You just spent hours lying on the sand beach, listening to the sea breeze and the sound of waves or playing the favorite sports, creating a private space by drawing in the sand, building sand towers. There will also be time for seafood specialties in an ideal environment of immense sky and sunshine. After finishing the breakfast, you will pass through the wonderfully photogenic fishing village of Lang Co at the foot of the Hai Van Pass. Hai Van Pass is called the road “a deserted ribbon of perfection—one of the best coast roads in the world.” Lang Co beach is an attractive island-like stretch of palm-shaded white sand, with a turquoise lagoon on one side and 10 kilometers of beachfront on the other. Smooth sloping white sandy beach, turquoise blue clear waters, endlessly hills and mountains create such a charming landscape. The villagers are warm, hospitable and simple-minded. The seafood is fresh and delicious. 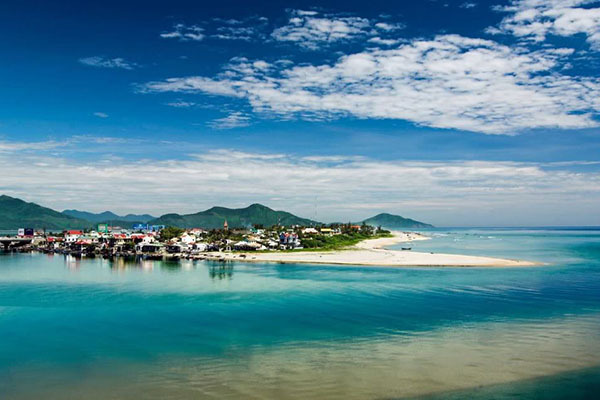 In addition, you will have a good time to enjoy the seafood with various kinds of shrimps, lobster, sea shrimp, crab, butterfish, mackerel fish, oysters, etc and not far from the beach are some attractions such as Lang Co fishing Village, Chan May scenery. It promises to be an ideal spot for all kinds of beach activities. Take on board along Huong river watching Bao Vinh old town which hosted a busy port in the 18th century, had 39 old buildings standing at the end of the American War. You should stop in Sinh Village where traditional painting handicraft has been practiced for hundreds generation and get a chance to meet the artisans and learn more about their age old techniques. If you have a free time, you can ride the small village of Thanh Tien which was traditionally the place where local craftsmen produced paper flowers, with techniques that had been passed down through the generations for hundreds of years. Hue is one of the most beautiful cities where was once Vietnam’s feudal capital. This small and quiet city is renowned for its magnificent architecture, beautiful pagodas, and royal tombs. 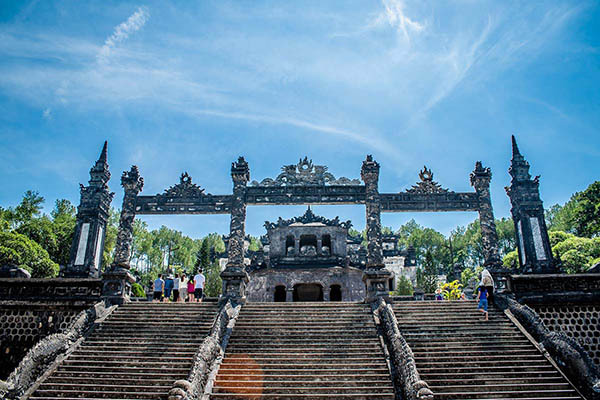 Hue holds the beauty of a Vietnamese feudal empire and the architecture system of Hue Citadel as the representatives of the authority of Nguyen monarch. The Citadel is the coherency of the decoration and oriental architecture, which creates a charming view of the city. Moreover, Hue is well-known with a lot of tombs and mausoleums. 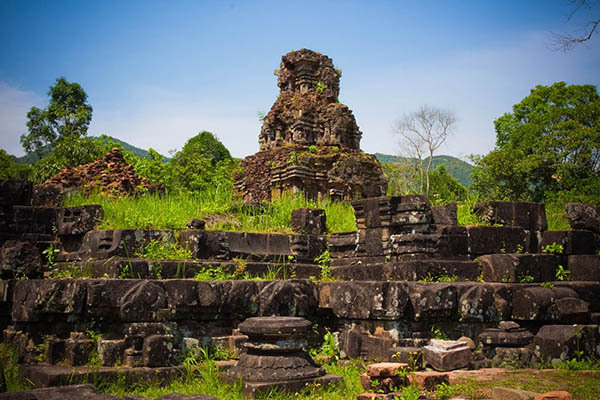 The tombs of the Nguyen Kings are always attractive travelers by the great achievements of the construction. It is voted that tombs will be the heaven for its owner for the life so it means that each tomb is based on the personality of the owner. Tu Duc’s tomb is considered to the most impressive of the royal mausoleums. In the first evening, you can impress yourself by joining one of the boat trips along Perfume River, savoring Hue Royal specialty and music. In Hue, you have a chance to enjoy the two magnificent and skillful kinds of music: “Dai Nhac” and “Nha Nhac” are developed from the old 8 kinds of ritual music under Le and Nguyen dynasty. Another destination in Vietnam Multi Center tour is Thien Mu Pagoda (namely Heaven Fairy Lady Pagoda), which is built on a hill overlooking the Perfume River, 4 kilometers Southwest of the Citadel. Of course, Thien Mu pagoda is one of the most fascinating and ancient pagodas in Hue city.